May 24 to May 31. Enrollment will not be open again until the fall. Don’t miss your chance to become a part of a community of bloggers, bakers, chefs and online entrepreneurs of all sorts. Do you want to take your blog–whatever your niche is–beauty, business, yoga–to the next level? Do you want questions to the endless technical and business questions you might have? Food Blogger Pro can help. 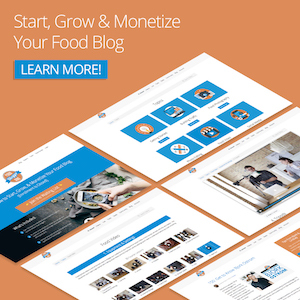 Food Blogger Pro is a membership site packed with resources, like videos, community forums and free access to experts in various parts of blogging-everything from technical issues to legal issues to content creation and more. I’ve doubled my page views every year since I started this website-except this year. This year my numbers are down. A lot of that has to do with posting content inconsistently. So, I decided to commit to a year of Food Blogger Pro and learn everything I can. There are so many things I don’t know that I don’t know. You know? You might think that because you’ve been a writer or a photographer for years that you can start a blog and be immediately successful. You would be wrong to think this . Blogging is a trade like being a writer or a photographer or a carpenter. To that end, it takes a good five to seven years before you know what you’re doing and your blog starts to sing. But, learning from others can help narrow that gap a bit. The Ostroms are definitely giving me a leg up. Two websites that I thoroughly enjoy and make a point to visit have been operating now for ten years. Yes, an entire decade. They are beautiful, useful sites run by creative, talented bloggers but it didn’t happen over night or even after a few years. They are Makeupandbeautyblog and Celebrate Creativity. Every day I watch a video ( there are over 350). The videos include the basics of wordpress to photography to video to composing a food photo to monetizing your site. Just one of the photo editing videos has transformed my photos. Food Blogger Pro has experts to answer questions and offer advice. Did you get a frightening email from google? Is something weird happening on your site? Post a note in the community forum and there will be an answer. Bjork and Lindsay, a former teacher, are big on sharing their knowledge. The site features live chats, workshops and videos focused on the art and business of blogging. Yes, the emphasis is on food blogging but the business side translates to all types of blogging and entrepreneurship. There’s a big community of bloggers that belongs to Food Blogger Pro. These are friendly folk that are happy to answer questions or offer support or give encouragement. There are opportunities to join group Pinterest boards, be featured in recipe roundups and other promotions. I’m especially excited about this workshop because I’ve done a little work with brands but I want to do a lot more. I have a lot of ideas percolating. Bjork and Lindsay know their stuff, which is evident in the income reports from their food blog, Pinch of Yum. Pretty darn inspiring, wouldn’t you say?